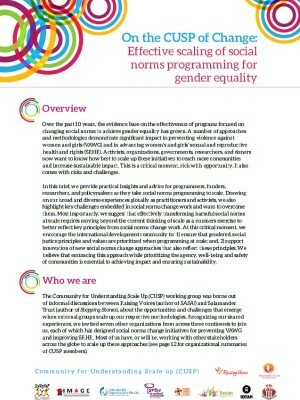 Over the past 10 years, the evidence base on the effectiveness of programs focused on changing social norms to achieve gender equality has grown. A number of approaches and methodologies demonstrate significant impact in preventing violence against women and girls (VAWG) and in advancing women’s and girls’ sexual and reproductive health and rights (SRHR). Activists, organizations, governments, researchers, and donors now want to know how best to scale up these initiatives to reach more communities and increase sustainable impact. This is a critical moment, rich with opportunity. It also comes with risks and challenges.